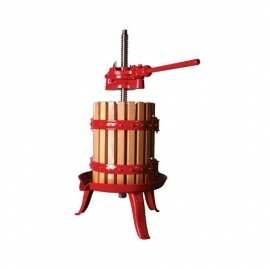 Suitable for the outdoor pressing or milled apples and crushed grapes. A larger spindle press, ideal for those who have plenty of time to press "little and often"
Simple to use, just fill the cage with crushed fruit, assemble the semi-circular pressing plates and large iron nut on top of the crushed fruit and use the iron bar to screw down. Juice flows out of the press cage into the base plate for collection. Cage Diameter: 23.5cm / 9¼"
Overall diameter: 36cm / 14¼"
Please note: - From November to April this product is available direct from the manufacturer with a 5-7 day lead time.